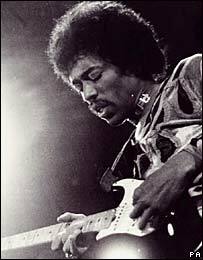 Jimi Hendrix has been crowned the "wildest guitar hero" of all-time in a poll of music fans for Classic Rock magazine. The guitarist, who made his name in the late 1960s with songs like Hey Joe and Foxy Lady, died aged 27 in 1970. Hendrix beat Rolling Stones legend Keith Richards into second place, with Stevie Ray Vaughan in third. Classic Rock editor Scott Rowley said Hendrix had a "devastating technique" and "redefined the term 'guitar hero'". Led Zeppelin's guitarist Jimmy Page made it to number four, followed by Dimebag Darrell, who played for several heavy metal bands including Pantera and Damageplan. "Singers might think that they're the real kings of rock 'n' roll, but our poll shows that guitarists are far crazier, usually more talented and the real driving force behind the music," Mr Rowley said. Tony Iommi from Black Sabbath was voted number six, with Rory Gallagher and Van Halen's Eddie Van Halen following at seven and eight. Chuck Berry and Kurt Cobain also featured in the top 10. But The Who guitarist Pete Townshend and Guns 'n' Roses legend Slash failed to make it into the top 20.